The state of Louisina is a fishing wonderland, with numerous inshore and offshore saltwater species available to target. But the most popular gamefish out of all of them, despite rarely growing over 12 pounds, is the spotted seatrout. The coastal estuaries in the central and eastern part of the state are prime spotted seatrout waters, rivaling the best of any trout fishing hot spots in the world. If you're looking to try some speckled trout fishing in Louisiana, the six destinations below represent the very best the Bayou State has to offer. One of America's premier destinations for saltwater fishing, Venice is not only a popular launching pad for offshore fishing ventures, but also great nearshore action courtesy of the Mississippi River and the vast estuary system surrounding it. Thanks to all those inland marshes, there is a large amount of shrimp, menhaden, and crabs in the area, favorite baits of spotted seatrout. The mouth of the Mississippi seems to always be filled with seatrout, even when the water is in the dirtiest of conditions. Because of Venice's great location, there are numerous charters and guides available for hire that specifically target spotted seatrout. VeniceOne of the major launching pads to offshore fishing in the Gulf, with a variety of different species anglers can target, both nearshore and offshore. Click here for more information and links to charters and guides working in the area. Grand Isle is more than just a seven-square-mile barrier island, it's a fishing wonderland that ranks up there among the best fishing destinations in the country. The small community on the island booms in population in the summertime, when offshore charter fishing takes off. Closer to shores, however, should never be forgotten, especially when the speckled trout fishing is so good in the warmer months. Surrounding Grand Isle are reefs and several islands with both rocky and sand shores, all types of structure and cover specks adore. When you?re out on a boat fishing, look for birds diving into the water because there's a good chance they?re after shrimp, which is a seatrout's favorite meal. Anchor near where you think shrimp are, toss out some bait of your own ? like live croaker ? and get ready to reel in some specks. 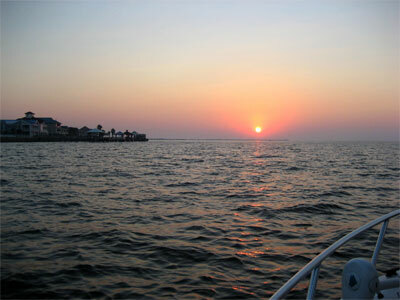 Grand IsleThis barrier island's location makes it the perfect launch location for great inshore and offshore fishing. Click here for more information and links to charters and guides working in the area. 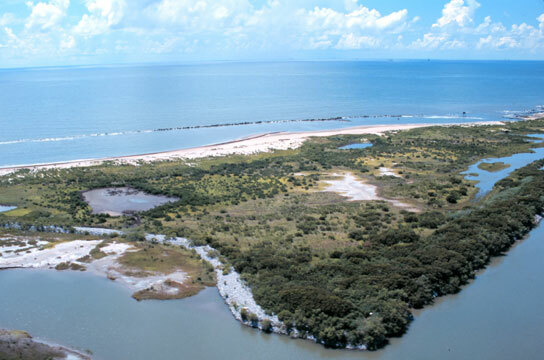 This inlet of the Gulf of Mexico connects directly to West Cote Blanche Bay to the east, and separated from the Gulf itself by Marsh Island to the south. It's a popular destination for anglers wishing to get out of Lafayette to the north for some inshore saltwater fishing. Unlike many other coastal inlets, Vermilion Bay has a relatively low saline level, but when this increases in the warmer months of the year, spotted seatrout arrive in droves. As the saline level rises in the bay, the further north trout will travel, even as far as Weeks Bay. For specific fishing spots that consistently deliver, try the waters around Cypremort Point and Marsh Island (the side depends on the saline level and clarity of water). Vermilion BayVermilion Bay, an inlet of the Gulf of Mexico south of Lafayette, is a popular destination for anglers wishing to get out of the city for some inshore fishing. Click here for more information on this great fishing destination. 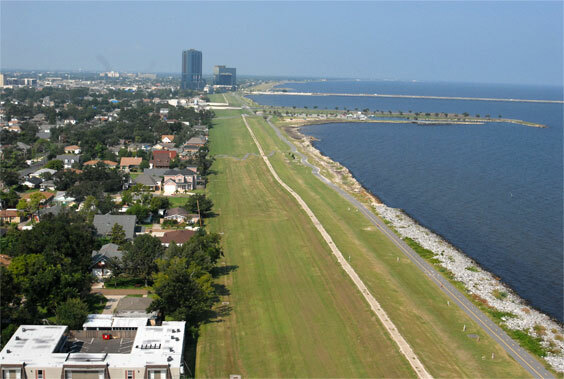 Lake Pontchartrain is a 360-square-mile brackish estuary located just north of New Orleans in southeastern Louisiana. Catching spotted seatrout can be a little hit or miss at times here, but when they?re on, there's enough action to satisfy any angler. Fish move around the estuary based on tides and salinity level, avoiding dirty water where possible. You?d do well to read reports before heading out, or go out on a chartered boat with an experienced captain instead. A popular spot in Lake Pontchartrain is the Causeway bridges, where speckled trout flock to at certain times of the year. Troll along these great bridges, or jig along the bottom as you slowly move across the span of the structure. Trout are more common throughout the year in the east near the Rigolets, where it opens up into Lake Borgne and the Gulf. On this side, fish around train trestles for best results. Lake PontchartrainA unique fishery with brackish water and plenty of different sources of cover for fish, including one of the longest bridges in the world that draws in fish like a magnet. Click here for more information and links to charters and guides working in the area. When the tide is right, fishing for speckled trout around the Timbalier Island system can be a dream. The marshy areas on the three main islands ? East Timbalier Island, Timbalier Island, and Last Island - provide a perfect nursery ground for shrimp and other baitfish. This of course attracts all kinds of trout, just waiting to be caught. Anglers fishing in Timbalier Bay, especially close to the islands, are at the mercy of the tide. The bay is rather shallow, averaging no more than eight feet, making navigation around the numerous sandbars and rock barriers a tricky task even when the tide is right. Going out with an experienced chartered service is recommended before attempting to traverse the area yourself for the first time. When it comes to speckled trout, you may find yourself having better luck at nighttime, when fish are more concentrated in certain areas. This makes navigation more difficult, but there are nearby service canals and oil rigs that offer decent lighting when trying to boat around the bay. TimbalierThe island system in Timbalier Bay, when the tide is right, is a popular destination for anglers, especially for spotted seatrout. Click here for more information and links to charters and guides working in the area. Calcasieu Lake, south of Lake Charles, is arguably the state's most popular and productive destination for huge spotted seatrout. Many believe that somewhere amongst the oyster reefs lies the next state record trout, just waiting to get caught. Specks in the 5-8 pound range is common, with fish occasionally caught between 9 and 11 pounds. 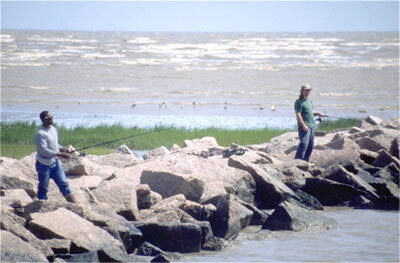 Try the points near the Calcasieu Ship Channel, or up the estuaries to the north, for best results. In the south, fish the big oyster reefs in West Cove, especially if there's a south wind. Anytime from March through to the fall is great trout fishing, but the best time is in May, when three of the largest certified trout were caught. If you?re specifically looking for big trout, remember to use larger lures and fish bait. Shrimp is better for catching seatrout under four pounds. 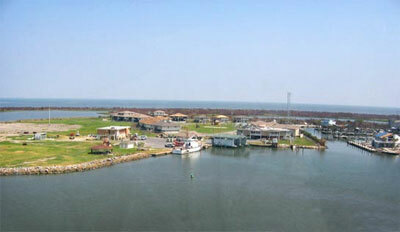 Lake CharlesCalcasieu Lake is south of Lake Charles, one of the largest incorporated cities in the state. Click here for more information and links to charters and guides working in the Lake Charles area.